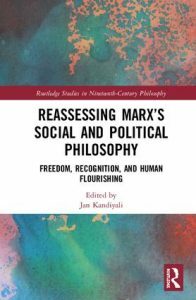 Marx & Philosophy Review of BooksBooksJan KandiyaliReassessing Marx’s Social and Political Philosophy: Freedom, Recognition and Human Flourishing. Reassessing Marx’s Social and Political Philosophy: Freedom, Recognition and Human Flourishing. Bibliographic information: Routledge, London, 2018. 286pp., $140 hb.